If, like many organisations, you want a more responsive and agile organisation that is sensitive to the changing demands of your environment, then the answer lies in the way your strategy and plans are managed: Your Strategic Management and Planning Processes. When you get your strategic management process focused on learning and agility, then the operational processes can naturally follow. Improving Strategic Performance Management means the organisation’s attention is focused on the strategic themes, drivers and objectives so they happen. Improving Operational Performance Management ensures the tactical and operational details and executed. Together they give you a complete system to manage and improve performance. We go further and help organisations to become more agile and responsive by adopting an approach to strategy as a process of learning. Our Fourth Generation Strategic Balanced Scorecard approach provides some of the tools and techniques to support a more agile and responsive strategic management process. As the video below shows, strategic performance management links strategic planning and operational management as a coherent pair within the Strategic Learning Model: how the model promotes agility and learning from your strategy. A simple, short explanation of the strategic learning model, presented at a conference several years ago. You will have noticed that this model does not assume that strategic planning is an annual process. Rather it is a continuous process, where strategy gets refined and developed as it is implemented and management learn from that implementation. This means the approach naturally supports rolling forecasting, rolling budgets and planning. Of course when significant events happen, a more significant update to the strategy can be implemented. All we are talking about is spending more time in the strategic thinking and alignment area before the processes restart. That does not need to be at a particular time of the year. Unlike many strategic management models you will notice that there is no assumption in this Startegic Learning Model of top down strategy. 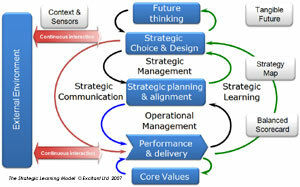 On the contrary, this model supports strategy emerging, as it naturally does, from lower down that organisation. This in itself supports agility making it easier to assimilate new ideas into the overall strategy and direction. This is all a part of our Fourth generation approach supports Strategic management for more agile, responsive, learning organisations. Improved management of performance, line of sight and quality of execution. People understand what needs to be done. You have created a culture of performance. Better alignment between the strategy and the organisation, so it happens. Learn about your strategy: You can tell whether you are making progress; You can refine your strategy as you learn from it. Greater understanding of the strategy. It gets into their heads, hearts and hands so they make it happen. A clear strategy that is being executed. You are able to tell the story consistently so people get it, and track progress to ensure it is happening. As things change you can refine your strategy and re-communicate it. A clearer sense of direction.. People understand what the organisation is trying to achieve and how they can contribute. Hover your mouse over parts of this diagram to see how different aspects of performance management address different management and governance needs. However, when performance management becomes too focused on risks and control, or operations, it can lead to you being swamped with measures that provide operational detail but that do not support the strategy. You can end up with “measure mania”, “the tyranny of targets” and “feeding the beast”. You don’t want this, do you? A properly designed and implemented Modern balanced scorecard approach (fourth generation) avoids these problems. It makes clear where you are going, articulates the strategy, and fills in the details of objectives, measures , targets, projects, investment and responsibility . You are clear. You can communicate it better. your Strategic performance management process ensures you deliver results. How well do score on each of these characteristics? We help you focus on the strategic issues and fix the operational problems. You can concentrate on what you want to manage and influence, rather than what you can measure. We help you ensure your people understand the strategy. We help you concentrate on what will make the biggest difference.